Home » Lended or Lent – Which is Correct? Many language learners consider English a difficult language to master, since it breaks its own rules so often. Spelling and pronunciation are rarely consistent, and if that weren’t enough, even verb conjugation has so many exceptions that we have an entire category for verbs that don’t follow the rules: irregular verbs. Lend, for instance, is an irregular verb. While most verbs become past tense by taking on the –ed suffix, like watch and watched or hunt and hunted, lend is conjugated into the past tense by changing the D to a T, forming lent. Is there ever a time to use lended? What is the past tense of lend? 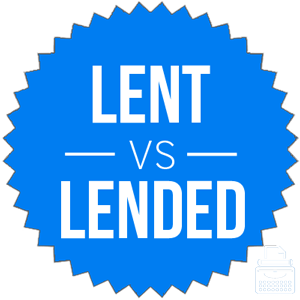 What is the Difference Between Lended and Lent? In this post, I will compare lent vs. lended. I will outline the correct conjugation and use it in example sentences, so you can see how it should appear in your writing. I will also show you a trick to remember whether lent or lended is the correct word. These tricks are called mnemonic devices. What does lent mean? Lent is the past tense of lend, which means to give someone money or goods with the expectation that it be given back. Lend is an irregular verb, so its conjugation is not always intuitive. Carol knew that her sister would never pay back the money she lent her, but she kept doing it anyway. Kenny and the neighbors lent each other tools so often that it became difficult to remember which tools belonged to whom. What does lended mean? Lended is an incorrect conjugation of the verb lent. It is rarely found in any print source, edited or not. As you can see, despite the gradual decline of lent, lended has not risen to replace it. In fact, lended is so infrequently used, that it approximated zero. Bryan Garner, in his book Garner’s Modern American Usage, estimates the ration between lended and lent to be 1,557:1. In other words, you should never use lended. There is only one correct conjugation of the verb lend, so it isn’t difficult to choose between these two words. Bent is another past tense form of an irregular verb. Bent and lent rhyme, so as long as you can remember the rhyme, you shouldn’t have trouble remembering to use lent as the past tense of the verb lend. Is it lended or lent? Lend is an English verb that gets conjugated in an irregular was. Lent is the correct conjugation of lend. Lended is an incorrect conjugation of lend. 1 What is the Difference Between Lended and Lent? Lasagna or Lasagne – What is the Correct Spelling?